GO! GO! 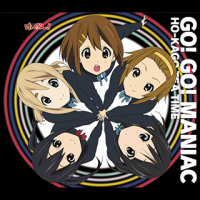 MANIAC was used as the first opening theme of the K-ON!! (けいおん!!) anime series. GO!GO!MANIAC was added to BeatStream アニムトライヴ on July 14th, 2016. In the BeatStream series, GO! GO! MANIAC's title is shown as GO!GO!MANIAC. GO! GO! MANIAC was added to GITADORA Tri-Boost Re:EVOLVE on February 13th, 2017. GO! GO! MANIAC was removed from jubeat festo on February 25th, 2019. This page was last edited on 25 February 2019, at 03:50.